Are you seeing a pattern here among classical learning? It’s so important to lay a strong foundation for our little scholars to build upon. With a basic timeline memorized, our children can learn more and more about history as they grow and have a solid place to put it. History is more than information about isolated events, but also understanding how each event relates to other events, to geography, to religion, to science, etc. As believers, history is another chance to know God more by seeing how He interacts with mankind throughout time. 1. Memorize world events and U.S. presidents. 2. Memorize six short stories of twelve sentences each that summarize a major era. 3. Read lots of stories relating to the memorized time line and the short history sentences. 4. Copy and rewrite favorite paragraphs from history. Our family does most of these things through simple methods and materials designed by Classical Conversations. For #1 and #2, we learn the timeline, presidents, and history sentences during our community days and memorize them through more practice at home. 1) The cards puts the words they are saying in front of them (this is good even for mine who aren’t reading yet). 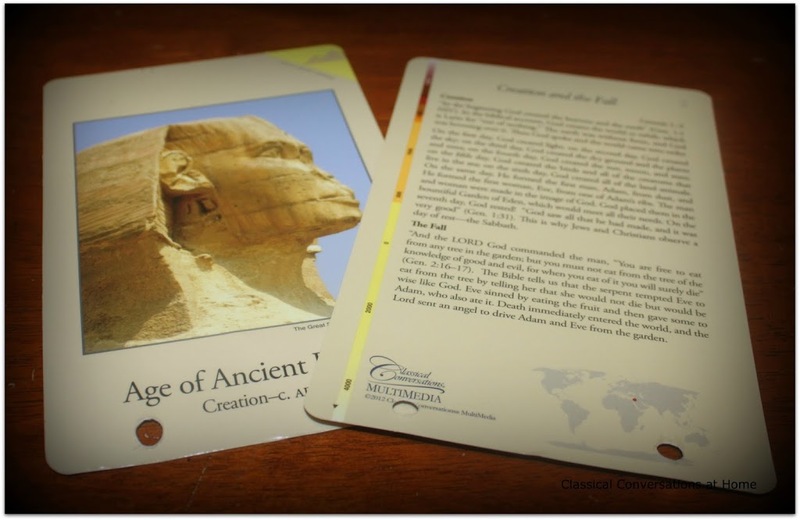 2) The cards help them distinguish between each event. 3) The cards provide more exposure to classic art. 4) The cards give us information about each event to discuss when wanted. Oh & a quick, helpful tip for using the timeline cards on rings given to me by a friend: Hole punch the cards at the bottom, rather than the top of the card to make for easier flipping through the timeline. For memorizing presidents, we sing the president song and use presidents placemats at meal time. It’s funny to hear what conversations my littles start when looking at all the presidents. But, really we talk about the presidents more with the placemats out and put faces with the names we’re memorizing. For history stories, we read books from the library, biographies found at used book sales, and The Story of the World (there are four volumes). We also read from The Kingfisher History Encyclopedia and keep it out for browsing. And finally, for #4, we are writing historical copywork by using Prescripts from Classical Conversations. I’m excited to use this new material for the first time this year. What about you? How do you bring history into your home? You can find the rest of the At Home with the Classical Method here. So just this morning, I had a chance to open it up and listen through it with my kids. I’d say it will be a hit, though I am almost certain now that I also want to add the flipcards as well for a visual aid. Great post, and love the idea to use the president placemats. Other than that, you pretty much describe how I also teach history to my children…oh, this year I did add the Record of Time book by Homeschooling in the Woods, which we’ll use over the course of several years. cool, joanna! i’ll have to check out the record of time book! I too love the timeline song. I find myself singing it in my sleep:) Let’s just say it’s a hit in our home…lol. Anyway, I basically do all that you do except we just use The Mystery of History along with The Story of The World. Thanks for the tip on the position of the rings for the timeline. Looking forward to hearing how the scripts work for your kids. isn’t that a great tip, stacy? my friend rocks : ) thanks for staying in touch!! We are also memorizing history songs, but we are using the Veritas Press ones (CC used to use their cards, right?) Then we read stories to go along and do copywork and notebooking pages each once a week. I really like how it is going so far and am excited to continue with it this year. I love the idea of using those place mats! I’m going to keep those in mind for sure. When I first joined CC, the Veritas Press cards were still being used. Sounds like we do alot of the same things, Amy! : ) That encourages me that I’m on the right track!